The Association for Human Rights in Ethiopia (AHRE) condemns the violent and brutal attacks against innocent residents of Addis Ababa and the neighboring town of Burayu. 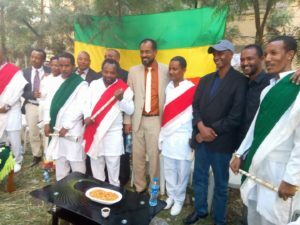 On September 15, 2018, ethnic Oromo and Addis Ababa youths were involved in violent clashes over the choice of flags in different parts of the capital, including Piazza and Kuasmeda. The Oromia Region Police Commissioner announced today that 23 people were killed during clashes since Friday. Federal Police also reported today that at least 600 people who were involved in the violence have been arrested. Police also confirmed that five more people were killed today, September 17 during clashes between security forces and protestors in Addis Ababa who were marching in protest of the killings and violence of the prior two days. The Association for Human Rights in Ethiopia (AHRE) warmly welcomes the news on the Federal prosecutor’s decision to drop all charges against 62 federal political prisoners. The list includes 26 inmates charged for allegedly setting Qilinto prison ablaze, including Dr Fikru Maru, a renowned cardiologist and humanitarian; and Masresha Sete, a former pilot of the FDRE defence force. We are confident that all 62 inmates will be released shortly without any altercation. On February 2018, AHRE had published a report, with detailed accounts of gross human rights violations committed by prison authorities against the detainees charged for ostensibly burning Qilinto prison. ·       Lift the ban on basic freedoms and fundamental rights that are enforced by the authorities and Command Post following the declaration of the state of emergency.